My wife wants to take better photos. This means someone needs determine what she already knows and fill in the gaps. To work with her, I have been trying to remember the first basics of photography that I learned 35 years ago. I realized that there has been a lot of progress in camera technology in that time. Cameras now determine the correct exposure, focus, and some can even correct minor composition issues. Digital is the biggest change that has happened and that was during the time that I was away from photography. The single largest advantage that is provides is the ability to immediately review a photo and decide if it is acceptable, no more waiting to process the film and make a print to see if the image is what you expected. That is most of the basics that I learned years ago and leaves the composition as the main basic to teach someone. The rest of the old basics now seem to be considered advanced techniques. During this contemplation, I remembered the first camera that I used and think I still have somewhere, an old Kodak Brownie Hawkeye. This is an old roll film camera that took 620 film and 12 pictures on a roll. It is actually a medium format camera with a negative size of 6cm x 6cm. It is a really basic camera with no shutter speed control, no aperture, and no way to focus. This makes it similar to modern digital cameras in the fact that all you have to worry about is composition. It also means that the first thing I learned was composition and did not learn about focusing and correct exposure until I was given a 35mm camera. I need to track down basic articles and guides on composition and go through them with my wife. I will post links to any decent articles that I find. The review will be good for me and also help her to become a better photographer. So her camera will stay in automatic mode to deal with the major settings while she improves the composition of her images and her eye as a photographer. We are going to join the Reno Photo Club at the meeting tonight, my family were members when I was learning the feedback from the competitions was helpful and the workshops were very good. I was just reading an interesting article about High Dynamic Range Photography at The Art of HDR Photography Part 1: Guides: Learn: Digital Photography Review. The author provides a very through walk through of the details of the technique and why it can be useful. I have worked with some HDR images using my Canon A720IS with the CHDK that I referenced in an earlier post. This image is one of my attempts with HDR images. 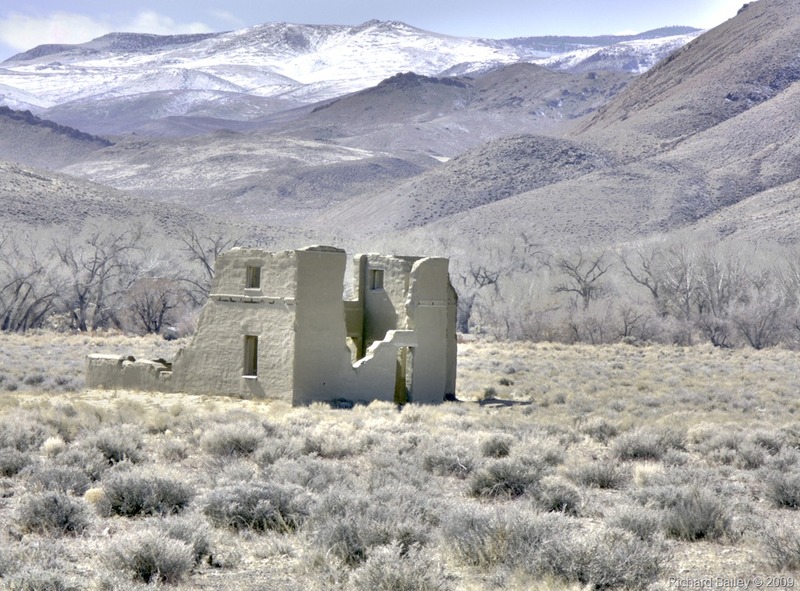 The difference from the original files is in the shadows within the building and the additional detail in the shadows and the sagebrush. I achieved an interesting image by combining some night shots in downtown Reno. The visible clouds and the bottom of the river are enhanced by the combining of the images. 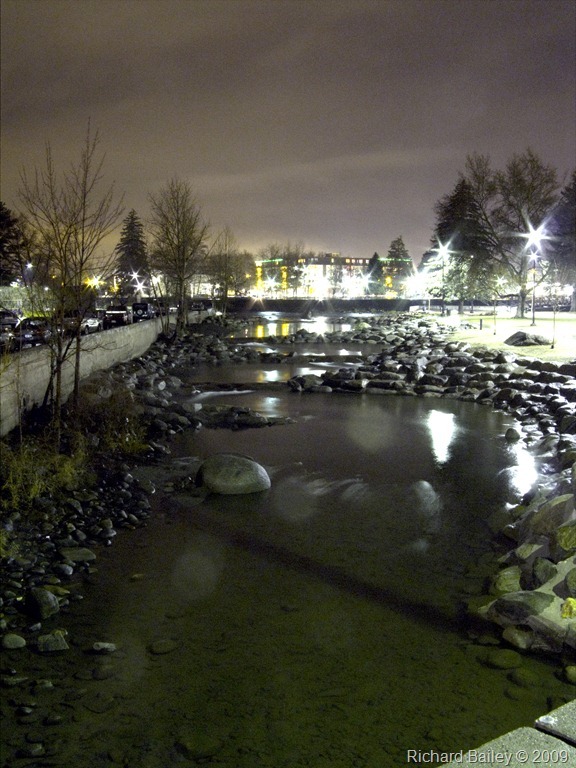 These and several other HDR images that I created are at my office live photos, here are thumbnails of them. I plan on doing more of these images after I get the new camera next month. The photo at the top of my blog was taken on the Fourth of July weekend in Eastern Nevada. My wife and I were camping down the canyon from this beaver pond that was clearly labeled as an “abandoned” beaver pond. Is seems that they forgot to inform this beaver. This Image was shot with a Canon A720IS that I am using CHDK on to greatly extend the abilities beyond those intended by Canon. I feel that it is worth the time and effort to read up on this software and use it. I will continue to use this camera after I have a better one. This will become my knock about camera that I take places I am not willing to take a much more expensive camera.